Bolt on rail pockets, drop rails into place and you're ready to go. Easily access guarded areas for maintenance or other needs by lifting out your guardrails. Connect starters to adders to build longer sections of guard rail. Rail lengths are measured post center to center minus 1" (pocket spacing). Actual length is 5" greater than listed. 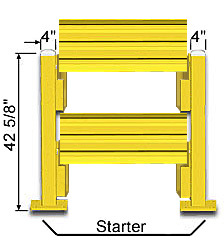 Starter Units consist of 2 posts, 2 guard rail, hardware, 4 lift-out pockets (right & left), and floor anchors. Adder Units consist of 1 post, 2 guard rail, hardware, 4 lift-out pockets (right & left), and floor anchors. Rail pockets: 15"H x 4-1/16"W OD (3-3/4" W ID) x 2-1/4"D. Adds 1/2" to width of post; each pair of pockets (left & right) adds 1" overall to clearance needed between posts. Industrial lift truck accidents are a common and costly occurrence. OSHA estimates that there are 68,400 accidents, each year, involving powered industrial trucks. Approximately 90,000 workers suffer some type of injuries in these accidents, resulting in lost work time, workers' compensation claims, and productivity losses - not to mention the damage inflicted upon equipment and facilities. About 100 people lose their lives each year in these accidents. Steel King's "Steel Guard" protective railing system is a cost effective barrier against the effects of such accidents. Adding rail pockets provides the capability to create temporary access points for bringing in bulk materials, moving equipment, transferring manufactured goods, and more. Great for shielding yet providing access to production equipment, conveyors, workstations, docks, racks, mezzanine bases, in-plant offices, tool cribs, building walls, and more. With special rail pockets mounted to the guard rail posts, gaining access to protected areas or closing off access is an easy process. When rails are placed into the pockets, you receive the same level of strength and stability as bolt-up rail. Lift out the rails when you need to open a section of guard rail or need to reconfigure. No need to remove bolts.